Saturday’s march was nothing short of incredible. Standing on the stage in Parliament Square, in front of an endless sea of people, I was blown away by the energy and sheer weight of support behind this campaign. 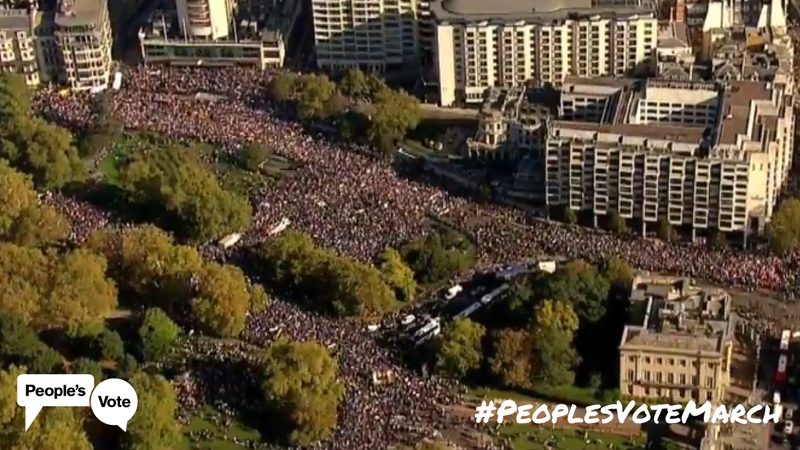 From all regions and nations of the UK, and all walks of life, 700,000 of us came out in force for one of the biggest demonstrations this country has ever seen. It simply couldn’t have happened without your generous donations, which helped to pay for the logistics, advertising, social media and campaign materials that made the event such a success. So, thank you for your amazing support and commitment. Now that we have this momentum, we need to channel it towards persuading a majority of MPs in Westminster to back a People’s Vote. This is a huge task, and we have just weeks to do it. So, will you chip in to get our message out to MPs and to take our campaign to key constituencies across the country? As we saw on Saturday, this is a genuinely cross-party campaign in Parliament – but we have a huge job ahead of us to convince enough MPs to do the right thing when the deal – or no deal – comes back. I and my colleagues in other parties will be doing everything we can to persuade other MPs. But we really do need your help. So we’re rolling out a huge campaign to ramp up the pressure on MPs. Can you help? The march on Saturday was an extraordinary moment of optimism, amid the chaos that Brexit has now become. Let’s make sure it is a turning point. If we are loud enough and persistent enough, we really can make this happen. P.S. All the videos from the March last Saturday in one place. Relive all the action here. Previous How would you balance the budget? Yes – It is time for the British people to have their say. Why would anyone not want this? Perhaps because the British people have already had their say Joan, or didn’t that count? Yes – We did have a referendum and we voted to remain. Not everyone was happy with this and campaigned for and were granted a second referendum. Some years have now passed since this second referendum and there is still no clarity as to what Brexit means. Democracy does not stand still and it is right that we now ascertain what the public want to do. Two years is certainly not ‘some years’. Let me put it this way; Some years ago (43 to be precise) the British electorate voted to remain within a trading organisation known as the EEC, or Common Market. Two years ago the British electorate voted to withdraw from a club that had appeared and grown and that was operating far, far differently to the EEC. Said club was one that we had not voted to join and had in fact encompassed us by stealth, aided by politicians. So it was decided to leave said club. So 700 000 people had a day out wandering around the streets of London shouting and waving placards. At the same time some 35 million other voters didn’t, either because they didn’t know about it, didn’t agree with the object of the day out, or just could not be bothered. 700 000 isn’t really very many and yet a few people seem to think that the number involved means that the rest of the electorate want to hold another referendum. Even with your obscure way of vote counting its hardly a majority is it? Truth is, the number that went to London is roughly half of the majority who voted to leave two years ago. It is not clear that “opt to remain as before” would be an option. I have not seen any serious discussion on this point but it might well be that the 27 are unwilling to take us back on the favourable terms we had prior to issuing the notice to leave. It seems very odd to me that there is such a great fuss about re-voting on something that has already been decided, ie Britains Exit from the EU. Should a mere 700000 people be permitted to force a second vote. If that was allowed to happen it could lead to serious repercussions in the future. For starters, the use of referena (‘referenda’ means votes on separate issues. The Daily Edge 4 Oct 2013) could be used on many, if not all, of governmental decisions that actually affect the majority of people in the UK. Items such as LGBT issues, whether there should be anymore mosques permitted within the country, sentencing guidelines for the judiciary. Local issues such as Fracking could, in fact should, be held at local level. The list could be endless. However there is a strong case for holding such referenda, it works extremely well in Switzerland both at local as well as at national level. Back in the 70’s as has been stated by others we joined the Common Market. The argument then it would be very good for trade and business. A Labour Government that was in power in 1975 when the First Referendum was held. I was at one of the counts in Horncastle and remember that the votes on the ‘In’ side were about double those on the ‘Out’ side. Nobody voted two years ago to be poorer. Most business people trading now with Europe do not want to leave the Common Market and the Customs Union as they know that if we do then their businesses will suffer. That will mean their employees will suffer. We do not like the fact that the EU appears to be undemocratic and with all the diverse populations within the countries in the EU it is difficult for individuals in the UK to have a voice in the decisions made in Brussels and Strasbourg. It is also inefficient to have the two places for the EU bureaucrats to meet. It is also wrong in my opinion that the European Courts can overrule our UK Courts of Justice. Free movement of people in Europe works two ways and it is good that many British people go and work or retire in mainland Europe. Our Health Service and Catering Industry have been suffering during the last two years as the Europeans have been going back to their own countries. Theresa May is attempting to negotiate a deal that will keep us within a good trading relationship with the EU and hopes to protect the border in Ireland. This really means that we stay in the Customs Union. I have never voted for the Conservative party, much less for our incumbent MP but for once I can fully support her and trust that the end result of this campaign concludes with no Brexit and the whole of the UK remaining in Europe. I watched the march on TV. An old newsreel from the 1930’s came to mind. That was the march of Oswald Mosley and his Blackshirts. The parallels are unmistakable. In the 1930’s the Blackshirts represented Rule by Decree. They had a complete contempt for Westminster and democracy. In 2018 the EU supporters represent Rule by Decree from Europe. They have a complete contempt for democracy and the People’s Vote in 2016. In both marches many were sheep with no real idea of what they were marching for. With Mosley it was fascism. In the case of the pro-EU march it was proto-fascism. These people are calling for the British people to be giving a say on matters. The only people who will be opposed to this will be people who don’t want a people’s vote. You may not want a people’s vote because you may be thinking the people will not vote how you want them to but in a democracy we do have to accept the will of the people. We already had the People’s Vote. It was called the Referendum! Yes – Howard I know and we voted to remain. However, you and other people would not accept this result and called for and were granted a second referendum. Given that this second referendum has resulted in no clear way forward in terms of what should happen a third referendum is now being called for. Two different referenda about two different subjects. The first to remain within the EEC, the second to leave an organisation that we didn’t vote to join in the first place; the EU. The E.E.C. was entirely different to the E.U. The former was a trading block. The latter is political, authoritarian, centralised, antidemocratic and unelected. Please don’t mention MEP’s. They have no powers to bring forth legislation. Of course there is nothing to prevent a referendum to rejoin the EU in ten years or so. But the prospects of there still being an EU by that time are minimal. The Italians have started along the road to regain their sovereignty. Hungary has turned against the EU and has been suspended. The same is happening across the continent. When Brussels loses its second biggest net financial contributor the UK, German taxpayers will have to pay significantly more. That will be the end of Merkel. Her popularity is already in terminal decline. With its de facto head gone, the EU will crumble at an accelerated rate. Ian – and the third referendum will also be on something different – what kind of Brexit we want and whether we want it at all. Denying the British people a vote on such an important matter might be Howard’s way but it is not what the rest of us call democracy. Let’s here from the people. I suggest you read David Cameron’s Chatham House declaration. The result of the referendum would be honoured and implemented. There would not be another. That was the criteria upon which both sides fought the referendum. For the losing side to call for another referendum is antidemocratic and is the method employed by the European Union. There are two incorrect assertions in Howard’s comments. 1. The Single European Act (1986) and the Maastricht, Amsterdam, Nice and Lisbon Treaties successively extended Parliament’s prerogatives. It can now co-legislate on equal footing with the Council in a vast majority of areas (see Ordinary legislative procedure) and consultation became a special legislative procedure (or even a non-legislative procedure) used in a limited number of cases. This procedure is now applicable in a limited number of legislative areas, such as internal market exemptions and competition law. Parliament´s consultation is also required, as a non-legislative procedure, where international agreements are being adopted under the Common Foreign and Security Policy (CFSP). The legislative rights of MEP’s enabled Nick Clegg to “unbundle’ the telecoms monopolies in Europe and substantially reduce our telephone costs. 2. The referendum act was specifically worded such that any result was not binding on Parliament. David Cameron’s pledge was on behalf of his party – not Parliament. Legislation and are more informed. Referendums are subject to attributions not germane to the specific decision being requested. As you can see from the above I’ll informed commentaries can dupe the voters. Next time you hear Remoaner losers bleating about “not knowing what we voted for” consider this quote by the former EU Commission President. The EU constitution was rejected by French and Dutch voters before being rebranded the Lisbon treaty. It was voted down again by a referendum in Ireland. Unsatisfied with the result, the constitution was put to a second vote when the Irish finally gave in to the unscrupulous EU. And you still think that we got it wrong?